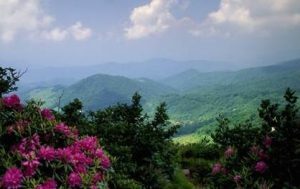 If you love living in our beautiful mountains, or are considering a move to Murphy, NC or the surrounding counties, you likely appreciate our region’s gorgeous scenery and feast of outdoor activities. However, you’ve probably wished that premier medical facilities, and highly regarded specialists, were much more accessible – especially for those facing serious or chronic health issues. Fall’s cooler weather and shorter days mean winter’s frigid temperatures are just around the corner. And when it’s really cold (and maybe snowy or icy) outside, you want to stay warm and cozy inside your Murphy, North Carolina mountain cabin. To ensure that your house is nicely buttoned up against the elements, here are seven easy steps for winterizing your home and property. And here’s the best part: you can prepare both large and small homes using the same guidelines. Adding insulation to your home can make the house feel warmer during the winter months. This is especially important in the attic, where beefing up the insulation prevents warm air from migrating to your roof, where it can lead to ice dams. Throughout every season, this extra insulation can help you conserve energy and save money, according to the United States Department of Energy. 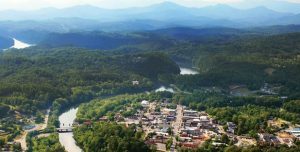 When you’re living in the mountains around Murphy, NC, you’re surrounded by lush green forests and sparkling mountain lakes. You’re also sharing your life with a diverse population of native wildlife. On most days, you’ll likely spot a group of deer munching on tasty bushes and trees. Wild turkeys perform seasonal struts across nearby driveways, and squirrels and raccoons scurry about looking for food and mischief. On rare occasions, you might even glimpse a lumbering black bear. Because some residents might wonder how to peacefully get along with the local wildlife, here are general tips that should apply to most situations. To resolve a specific issue, contact a local wildlife expert. Deer are voracious vegetation eaters who often gravitate to desirable trees, bushes, and groundcover plants. To discourage deer browsing, make your landscape less attractive to the hungry grazers. If possible, add deer-resistant shrubs, flowers, and groundcover to existing greenery. Protect individual trees, bushes, and groundcover with stiff plastic netting that still permits sunlight. These tactics should reduce the deer’s impact on your landscape. If you’ve carefully cultivated a vegetable garden, or planted colorful flowers around your home, you want to discourage hungry deer from decimating your plants. First, trim the grass and underbrush around the garden. If you have nearby fruit trees, promptly harvest your ripe fruit and remove fallen fruit from the ground. Properly fencing your garden’s perimeter should effectively stop most deer in their tracks. Choose durable fencing with sturdy metal, wood, or fiberglass posts. Ensure that the fencing is at least eight feet high (yes, deer can jump that high), and set at least one foot below ground (yes, deer can stomp flimsy fencing into the ground). Allow no more than four inches between fence components. Visual stimuli such as mylar tape, strobe or bright lights, scarecrows, and motion-triggered water sprays might also help. 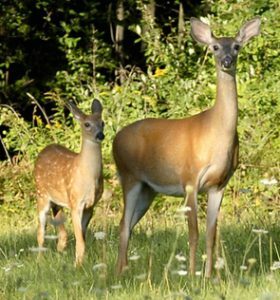 If a persistent deer somehow navigates your fence, discourage their snacking behavior by surrounding vulnerable edibles with deer-repellent plants. Examples include lavender, sage, spearmint, thyme, catnip, chives, garlic, and onion. For more information, contact a local plant nursery or your Cooperative Extension Service’s Master Gardener Program. Wild turkeys are constant grazers who naturally consume leaves, berries, seeds, nuts, insects, small frogs, lizards, and even snakes. Traveling in small family groups or flocks, they scratch their way through an area while searching for food. Next, they move to another spot and repeat the exercise. At night, they roost in convenient trees. Left alone, wild turkeys should cause minimal damage to surrounding residential areas. However, wild turkeys’ behavior can change when they’re given human-supplied food, such as deer corn or other tasty snacks. This new food source will first alter the turkeys’ foraging habits, and then their flock size may increase as other birds arrive to enjoy the bounty. The turkeys’ roosting behavior can also change, and they’ll likely decrease their travel range. The net effect: more turkeys will be living in a smaller geographic area. If wild turkeys settle near your home, and continue their scratching and foraging behavior, they can tear up your landscape and damage your vehicles, decks, and shingles. Male turkeys can show aggression when they’re expecting a handout or during breeding season. The answer is deceptively simple: Stop feeding the turkeys. Feeding them smaller portions will only cause the problem to continue. Once you stop providing any food, the turkeys will gradually return to their natural activities. Or, maybe you haven’t actively fed the turkeys, but they’ve been gorging themselves on leftover dog or cat food that you’ve left outside. Opportunistic turkeys also gather under bird feeders, methodically scarfing up stray seeds dropped by careless birds. 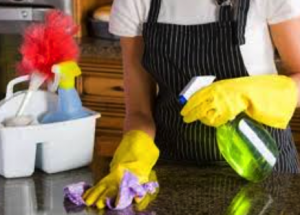 To discourage this scavenging, promptly remove your pets’ food dishes, and keep your bird feeding stations squeaky clean. Clever little squirrels naturally gravitate to any potential food source. In fact, you’ve probably seen them gorging themselves under your bird feeders. Although this seems harmless, it conditions the squirrels to expect free handouts at your house. If you really enjoy feeding the birds, buy “squirrel-proof” feeders with metal baffles that prevent the squirrels from climbing up to the feeding stations. If possible, locate the feeders in an open area so the little gymnasts can’t jump on a feeder from a nearby tree limb. If a squirrel jumps onto your roof from a nearby tree, they’ve surmounted a major hurdle in the quest to access your home. To deter them, trim tree limbs so they’re six feet (or more) away from your house. Although squirrels can also climb along cables or wires attached to your home, decreasing the rodents’ potential access points is a step in the right direction. Chances are, you know someone who has experienced a squirrel home invasion. These determined little rodents often sneak into houses, settling in the attic to nest and raise their young. They can access a home through an existing entry point, such as a chimney or open vent. If another animal has created a hole, a squirrel will happily use it to get inside your home. If necessary, they’ll gnaw their way in, often chewing on electrical wires and drain pipes in the process. To prevent the squirrels from entering your house, regularly check for potential openings, especially signs of active chewing. After confirming that no squirrels are in the house, block all openings with half-inch wire mesh. If a mother squirrel is raising her young in your house, wait until the youngsters have departed the nest. Then, place a one-way gate over the opening so the squirrels can leave but can’t return. Once everyone has exited the building, permanently seal the opening. Finally, remember that squirrels don’t usually launch unprovoked attacks on humans. However, if you attempt to catch a squirrel, it will probably scratch and/or bite in self-defense. To avoid that unpleasant outcome, contact a wildlife removal expert with the equipment and knowledge to safely resolve the situation. Raccoons are shrewd little problem solvers who will seize any opportunity to grab some food. To discourage them from visiting your property, securely fasten your garbage can lids. Remove your pet’s food and water dishes each night. If your property contains fruit trees, harvest the ripe fruit and quickly collect fallen fruit. Finally, don’t feed the raccoons under any circumstances. By providing them with regular meals, you’re acclimating them to humans, and possibly giving the quick little animals a chance to get inside your home. So, keep the “raccoon restaurant” closed, and the hungry little diners should look for a more hospitable location. Keeping raccoons out of your carefully tended garden might be an ongoing challenge. To increase your odds of success, consider acquiring a dog. Your pooch’s barking, and possibly their scent, may discourage raccoons from exploring your property. Inside the garden, grow a generous crop of squash, as raccoons don’t seem to like walking on the prickly vines. Sprinkle cayenne powder, or a 50/50 mix of garlic and chili powder, throughout your garden. Place motion sensor lights around the garden, as bright lights might discourage raccoons from prowling through the plants at night. Install a motion-detector sprinkler system, which you’ll activate during nighttime hours. Our mountain region is home to numerous black bears, which typically stay in their forest habitats and avoid human contact. However, on rare occasions you might spot a bear wandering through your property, searching for food. If you give the bear a wide berth, and don’t provide any food, the bear should eventually leave the area. If you make the mistake of feeding the bear, however, it’s likely to become dependent on human food handouts. As a result, the bear will increase its presence near your home, and will likely exhibit bolder behavior over time. If you do encounter a bear, don’t attempt to become “The Bear Whisperer.” Instead, remain calm and back away slowly while making as much noise as possible. Don’t ever approach or corner the bear, as it’s an extremely powerful animal that can move with incredible speed. Finally, as a general guideline, if the bear seems to alter its natural behavior while you’re there, you’ve definitely gotten too close and should carefully leave the scene. To discourage bears from hanging around your property, eliminate all potential food sources. Store your trash cans inside your basement, garage, or other inaccessible area. On trash pick-up days, take the trash outside that morning – not the night before. If you (or a neighbor) has spotted a bear nearby, minimize your outdoor pet feeding, and ensure that all bowls are removed each evening. Also, bears are notorious for vandalizing bird feeders and gorging themselves on tasty seeds and suet. To prevent this carnage, remove all bird feeders (and hummingbird feeders), even the “bear proof” models. Finally, clean your barbecue grill after each use, as bears are attracted to the enticing food and grease odors. Now that you’ve gotten acquainted with the Murphy, NC area wildlife, and learned how to share their natural environment, relax on your deck and enjoy living in our beautiful mountains. 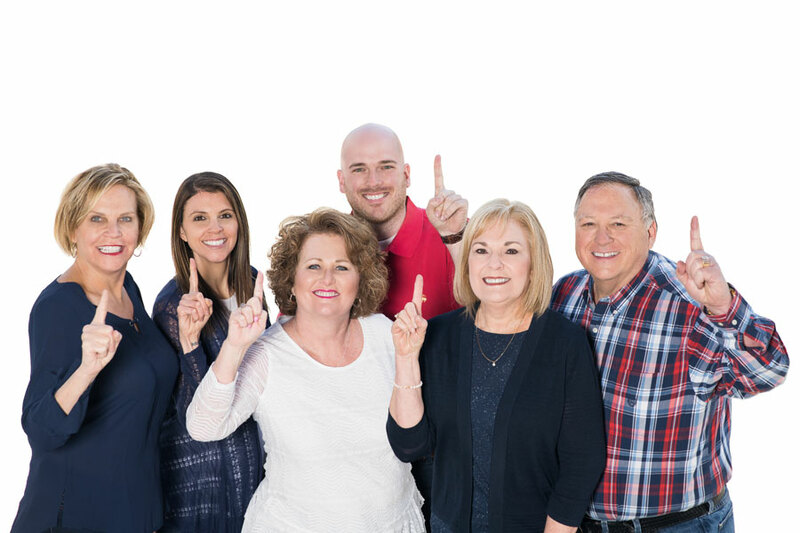 Completing a Murphy, North Carolina real estate closing is like attending a stage play premiere. In both cases, the players have prepared for weeks (sometimes longer), perfecting their roles and working smoothly with other ensemble members. Support personnel scurry behind the scenes, handling endless details and the inevitable snafus that threaten to derail the production. Despite the obstacles, however, the big day arrives as planned, and everyone eagerly awaits a reward for their hard work. Here in Murphy, NC and Cherokee County, weather forecasting has become a real spectator sport. You’ll likely hear spirited discussions at the gas station or coffee shop, or among shoppers in the grocery store checkout line, about our region’s notorious wild weather swings. Here in Murphy, NC and Cherokee County, trout fishing season is one of the rites of spring. Whether you enjoy bank fishing along a local river, or cruise your boat on one of our scenic lakes, you’ve got plenty of chances to play cat-and-mouse with those wily trout. So gather your fishing gear, buy a fishing license, and get ready to enjoy some quality time on the water in our beautiful mountains. In our western North Carolina mountains, you’ll find over 3,000 miles of rivers, lakes, and streams that have been designated as public trout fishing waters. 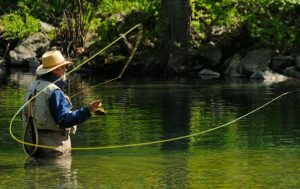 Here in our local region, the Valley River, Hiwassee Lake, and the Nantahala River are popular trout fishing destinations. Whether you cast your line from a convenient bank, wade into an ice-cold mountain stream, or putter along in a drift boat on the lake, you’ll find plenty of opportunities to challenge those crafty trout on their home turf. To learn about fishing destinations in Cherokee County, or similar spots in other western North Carolina counties, view the North Carolina Wildlife Resources Commission’s interactive trout fishing map. 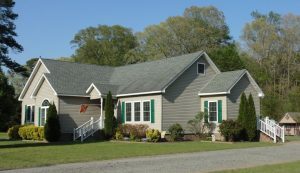 Choosing your North Carolina mountain home location is a great step toward achieving the lifestyle you want. Maybe you’ve enjoyed several weekend or vacation rentals, and decided it’s time to soak up our blue skies and mountain views all year ’round. And while you’ve savored your time spent in each North Carolina mountains home, Murphy, NC and Cherokee County are your favorite getaway spots. Watching the August 21 Total Solar Eclipse was like opening a highly anticipated present on Christmas morning. For several weeks (even months) ahead, we read about this rare natural phenomenon. 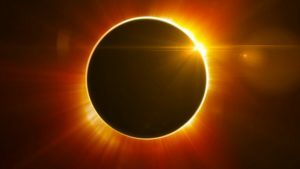 A total solar eclipse occurs when the Moon passes in front of the Sun, completely blocking the Sun’s light and briefly turning day into night. During the August 21 event, viewers in a nationwide 70-mile-wide swath would enjoy the maximum effect. Here in Brasstown, the spectacle began at 1:05 p.m. EDT in a clear, hot day dotted by puffy clouds. As we settled into our Brasstown, North Carolina viewing spot (just a few miles from Murphy, NC), we kept our eclipse viewing glasses and water bottles close at hand. Every few minutes, we slipped on the glasses and gazed at the Sun, watching the Moon’s slow migration across the brilliant white sphere. First, the Moon’s effect was barely noticeable; however, the Sun’s circular shape gradually transformed into an ever-shrinking crescent as the sky darkened around us. Shadows began to appear, and the surrounding landscape took on the colors of twilight. As the total eclipse (or “Totality”) crept closer, we noticed a drop in temperature, with some observers noting that it felt 10 degrees cooler. Shortly before the magic moment, our environment grew very still, with birds flying up to their nighttime roosts and crickets chirping in the distance. A rooster also began to crow, likely convinced that the “twilight” meant it was time to begin a new day. Finally, at 2:34 p.m. EDT, we experienced “Totality” in Brasstown, with a dark twilight taking over the forested landscape as the Moon completely covered the Sun. This amazing spectacle lasted only 2 minutes 26 seconds, giving us just enough time to enjoy the view before a sliver of sunlight peeked from behind the Moon’s shadow. When that occurred, we quickly donned our eclipse glasses to safely enjoy the rest of the show. Watching for more than an hour, we saw the Moon continue its path across the Sun, with daylight and warmer temperatures gradually returning as well. Finally, the Great American Eclipse was over, not to return nationwide for many years. As we swapped viewing experiences and sipped cold drinks, we marveled at this stunning solar extravaganza that had unfolded right before our eyes. This was certainly a once-in-a-lifetime event, made for sharing with family and friends across the country. Even better, we had experienced it from peaceful Brasstown, just a stone’s throw from Murphy, NC in a beautiful little corner of the world. 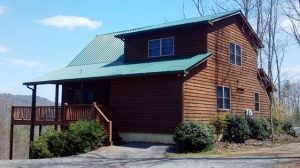 Deciding where to buy your North Carolina mountain cabin is like combing through a box of chocolates. You examine every delectable-looking piece, savoring its visual appearance and fragrance before selecting the most appealing option. As you enjoy your reward, you know you made the perfect choice. 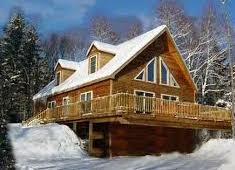 Likewise, you’ll consider several different factors when choosing your mountain cabins location. Of course, you want a beautiful and peaceful setting, but within easy driving distance of grocery stores and other shops. When you travel to town, you’d like a friendly atmosphere that makes you feel welcome. If you enjoy outdoor activities, you want varied options for yourself and your kids (or grandkids). And finally, you’re looking for an affordably priced property, leaving you plenty of discretionary income to enjoy the finer things in life. With spring’s arrival just a few weeks away, you’ve got the urge to give your Murphy, NC home a big cosmetic makeover. In other words, you’re gearing up for some serious spring cleaning. To keep from getting overwhelmed by the project ahead, break the work into manageable chunks. Plan to begin with tasks common to each room, and then put the finishing touches on specific parts of the house.